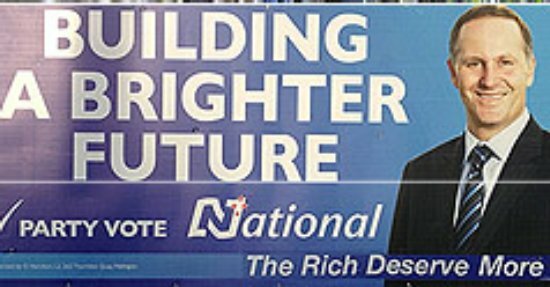 Jolyon White, a graduate in Theology from the University of Otago, has been cleaning up those misleading National Party Billboards that have been littering the landscape recently. White co-ordinated the campaign which added ”The rich deserve more” and ”Drill it, mine it, sell it” stickers to signs around the country. The Press alleges that Jolyon managed to fix up some “700 National billboards”, which is just an outstanding effort. Compare this with Jesus, who only cleansed the one Temple. The United Nations Committee on the Rights of the Child (56th session) notes that while the extent of child poverty has declined in recent years, it remains concerned that about 20% of children in New Zealand are living under the poverty line…. New Zealand is ranked in the bottom third of the OECD for income inequality…. Incomes remain much more unequal than during the 1980s…. New Zealand has large and persistent income differences between ethnic and gender groups. There are also an unacceptably large number of children experiencing hardship. The choice to favour investment in other segments of the population over children will have adverse consequences for New Zealand in the future. Insufficient response to this very unsatisfactory situation contributes to the overall grade of D.
Jolyon joins the ranks of other famous social justice protestors in recent years who have utilised creative vandalism, including one group that caused $1m worth of damages to the U.S. spy base at Waihopai – a military unit based in New Zealand which participates in the slaughter of Iraqi and Afghani men, women, and children. 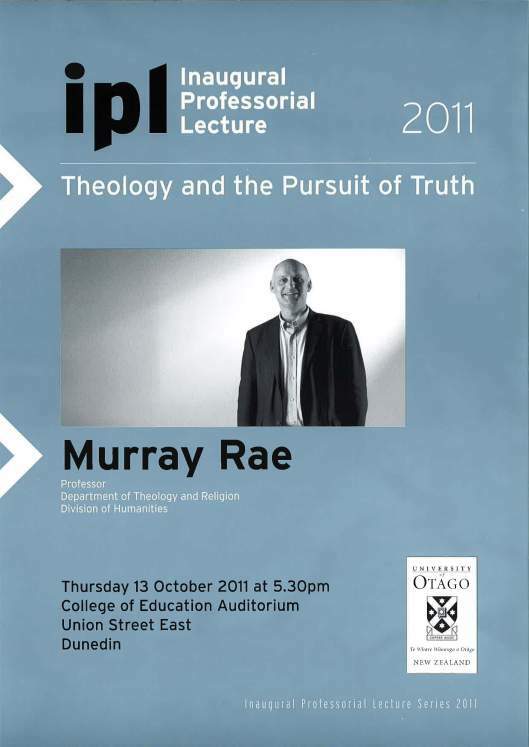 On 21 October 2010, the Centre for Theology and Public Issues invited one of the Waihopai protestors to speak at the University of Otago. Now, this is a real discount. Karl Barth’s monumental Twentieth Century systematic theology, Church Dogmatics, is available at a pre-order price of $99.99 – down 90% from the recommended retail price of $995.00. That’s in hardback, too. This is the old T&T Clark English translation, edited by T. F. Torrance and G.W. Bromiley. And the release date is 1 November 2010. Most of the 9,233 pages and over 6,000,000 words of Karl Barth’s ponderous prose should of course be ignored. But buried amongst the detritus of theological obtuseness is a short and surprisingly sensible mini-commentary on the Book of Job – surrounded as it is by some vacuous and atavistic comments about humanity. Do you think that little “vignette” could win me a free copy? And I wonder if it’s about to go out of copyright? Maybe somebody from Hendrickson could let me know. Update: Nope – Hendrickson say that is not the case. They just have a deal with T&T Clark to reprint the older 14-volume set, now that Continuum/T&T Clark is selling a 31-volume “study edition” set. And they’re doing it for $99.99. Isn’t that nice of them? Hat-tip: Jim West. The Monstrosity of Christ documents a debate between Milbank (a highly influential Catholic theologian and a founding member of the Radical Orthodoxy movement) and Žižek (a philosopher, intellectual celebrity and professional madman) about the nature of Christianity, or at least about Hegel’s interpretation of the nature of Christianity, largely as mediated through the central figure of Jesus as Incarnation. There is a good deal of interest in the book and both authors make some pointed criticisms of the other – Milbank accuses Žižek of being little more than a heterodox Christian, while Žižek claims that ‘it is Milbank who is guilty of heterodoxy, ultimately of a regression to paganism: in my atheism, I am more Christian than Milbank’ (248 – all page numbers in this post refer to Monstrosity). If for nothing more than watching two brilliant if equally flawed minds at work against one another, Monstrosity makes for very good, very fun reading. However, what stuck me as the most intriguing point of all of this was Žižek’s simultaneous defence of an essentially materialist (and thus atheistic) view of the world and his continuing interest in Christian intellectual history. In doing these two things at the same time, which might seem to be wildly counterintuitive, Žižek makes some tentative first steps towards establishing a viable and historically responsible contemporary atheism. He by no means settles the matter and by no means even thinks out his own argument through to the end (always a problem for Žižek), but what he does do is present a potential means of arguing for an atheistic worldview that properly acknowledges that such a stance occurs against a deeply-rooted religious milieu dominated by Abrahamic understandings of God. In Žižek’s view – and here I am extrapolating on his work here – atheism in traditionally theistic cultures is always already a matter of religion, but atheism is in itself not necessarily a religious position (though in some cases it must be). Žižek here pushes us towards a different and more substantive version of atheism than that being offered in the populist work of Christopher Hitchens, Bill Maher, Sam Harris, and Richard Dawkins. 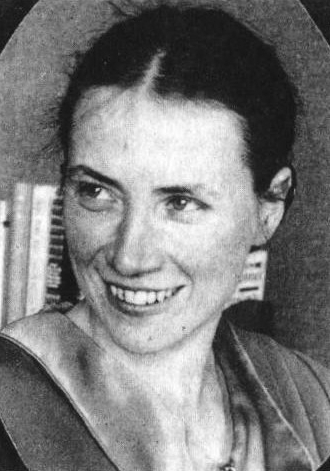 Regardless of what one thinks of these arguments from a philosophical or logical standpoint, the overarching point of much of this work, that religion in all of its forms – though they all, as a rule, focus on theistic traditions – is illogical, destructive, and misguided and should, therefore be discarded, or at least ignored, is eminently impractical. Firstly, people are rarely swayed by rational arguments in such matters. It is very difficult to imagine a new-earth creationist being swayed by Dawkins’ recent book defending evolution, The Greatest Show on Earth, particularly in a cultural climate where the teaching of evolution has again – and bafflingly – become a matter of controversy, in American schools at least. In such a highly emotional and frankly juvenile sphere of debate, Dawkins is going to be dismissed before his arguments are ever even voiced. Given this, such attempts at the reasonable assertion of atheism are preaching largely to the choir. If modernity has taught us anything, it should be that people will persist in all manner of irrational and illogical behaviour, no matter how rational our picture of the world may be. Secondly, and ever more so since the late 1960s, many froms of religion have shown that they can co-exist quite happily with the modern. Religion in its many guises is not going anywhere – though it will very certainly mutate into new and at times surprising forms – and to argue that it should (no matter how valid the reasons for making such a suggestion might be) is to argue in essence nothing at all, at least nothing with any social utility whatsoever. An incidental point should be made here as well: if we are to discard anything that is illogical, irrational, or responsible for violence and oppression, what would we be left with? To carry this logic through to the end, if we are to begin by discarding those religions that do not hold up under logical scrutiny, we must continue by discarding the mythology of the nation-state and finally rid the world of any and all financial systems based on illusory, artificial conceptions such as ‘money’. Any system that has the requisite complexity to exist in a modern society is going to be, to at least some extent, rooted in the selective application of reason and truth. To put this another way: are the central tenets of the Christian Trinity (to take a notorious example of convoluted religious nonsense) really any more nonsensical than Adam Smith’s ‘invisible hand’ or the belief that it is possible to have a financial system that requires infinite growth in a system of finite resources, two ideas upon which the contemporary world balances ever more precariously? If there is going to be a revolution of the rational, it will have to be total. All praise to Žižek aside for the moment, there is in all of this an unresolved and very troubling tension between Žižek’s evident hopes for liberation from the excesses of contemporary capitalism and what appears to be – and this is not putting it too strongly – a refigured Christian universalism. In all of this, when he uses the word ‘religion’, what Žižek is talking about is Christianity, the only religion he really considers in these essays. Even when he addresses Judaism, he does so obliquely and only as it pertains to Christianity. In doing this, Žižek is (oddly enough, given his track record) repeating a mistake made by a great many theologians, one arguably rooted in a long history of anti-Semitism in European intellectual history, and in Christian theology in particular. There is something odd, even disturbing, in Žižek’s reaffirmation of Christian universalism in an atheist guise, though such an idea does have a fairly long history, reaching its apex in the ‘death of God’ movement in theology, which briefly caught the public imagination in the 1960s to such an extent that it made the cover of Time magazine. Is this really a step away from the harm that such universalism has wrought in history, or merely a restatement of this central tenet of European superiority? Though he makes a compelling argument later in the book that seems to address this precise point head-on, one can’t help be beset by lingering doubts at taking such a tack in a work that purports to be advocating a new and less violent world order based on a new kind of balance between the secular (whatever that might mean) and the religious (whatever that might mean). Žižek argues that our position is thus a precarious one that our religious inheritance can help us to understand, regardless of whether or not we are willing or able to make the leap to theistic belief: ‘we created our world, but it overwhelms us, we cannot grasp and control it. This position is like that of God when he confronts Job toward the end of the book of Job: a God who is himself overwhelmed by his own creation. This is what dialectics is about: what eludes the subject’s grasp is not the complexity of transcendent reality, but the way the subject’s own activity is inscribed into reality’ (244). He repeats this all-important gesture a few pages later in answering the slightly different question ‘but why God at all?’: ‘The true formula of atheism is not “I don’t believe”, but “I no longer have to rely on a big Other who believes for me” – the true formula of atheism is, “there is no big Other”’ (297). We cannot ignore Christianity as a whole and the problematic of the Incarnation in particular, Žižek claims, because these things from an essential part of the intellectual world of modernity. Here he also offers at least a partial answer to my own charge of universalism, despite the fact that he never bothers to articulate this explicitly. Christianity achieves its unique position in history because it is an essential element of modernity itself, an essential piece of the dominant logic of a globalising capitalist modernity. Given this, Žižek is quite correct when he argues that he is moving into new territory with this particular argument: ‘A new field is emerging to which the well-known designations “poststructuralism”, “postmodernism”, or “deconstuctionism” no longer apply; even more radically, this field renders problematic the very feature shared by Derrida and his great opponent, Habermas: that of respect for Otherness’ (254). This is a hybrid (or, to use Hegelian language, synthesis) of modern and postmodern (to use two very loaded, very inadequate terms) territory that many others – Terry Eagleton, for one, in his After Theory (2003) – are also trying with varying degrees of success to define and understand. What Žižek does here is to make atheism respectable again, after the onslaught of what Eagleton quite rightly calls ‘school-yard’ atheists, reactionaries like Hitchens and Harris as well as (slightly) better-informed critics of religion like Dawkins. In Žižek’s arguments, we find the deeper meaning to Milbank’s assertion that ‘the supposition of naive atheists that the West can leave behind either Christology or ecclesiology is worthy to be greeting only with ironic laughter’ (181). One cannot blithely ignore the centuries of theological thinking that lies at the back of any assertion of atheism, philosophically justifiable as any such an assertion may be, at least not if there is to be actual, productive debate – not just people shouting at each other or simply restating their own presuppositions over and over again – about all of this. This might not be an argument that will ever be resolved, and The Monstrosity of Christ, may not document a proper argument in the strictest sense of the word – Žižek and Milbank might, as Dawkins and McGrath seem to, be simply talking past or at rather than to each other. However, Žižek, in dialogue with Milbank, gives us a way to argue – or to at least to begin to argue – for an intellectually respectable and historically responsible atheism that both avoids the abuses of an overly prescriptive ‘secular’ rationalism that seeks to discard the past and transcends this ironic laughter by searching to explicate the present though a respectful and critical re-examination of the past. For what has modernity taught us about history? The past haunts the present and there can be no exorcising the spirits of History. So even though the method was developed as a result of Enlightenment ideals of freedom from dogma, and before that from Reformation ideals of freedom from tradition – despite the genealogy which gave rise to it – the historical critical method is a neutral method. As theoretical logic this is probably quite right. It doesn’t matter what your motives are for constructing a method; evaluation of a method as ‘neutral’ or ‘biased’ depends wholly on the mechanics of the method itself. But in practice the historical critical method is never simply a matter of theoretical logic. It is always pressed into the service of some overarching project, whether Calvin’s attempt to establish a rival magisterium in the Bible, or Kant’s and de Wette’s project to establish a rival to church dogma, or the project of most recent confessional biblical scholars to serve the church. So, for example, even if there is no a priori reason why the historical-critical method should favour atheistic material monism rather than theism, its utilization by material monists will practically always favour atheistic conclusions, whereas its utilization by theists will almost always favour theistic conclusions. For the method is inseparable from its background presuppositions. These conclusions may not technically be the a priori result of employing the method, but due to the background, such conclusions are effectively a priori (or if you like, they are a priori results masquerading as a posteriori results – the situation of the ‘no true Scotsman’ fallacy). So in explaining an event – say the Resurrection of Christ (just to get away from 586 and all that) – although the method has the theoretical appearance of a netural method, there is no hope in hell that an orthodox Christian historical critic will ever weigh the evidence in favour of the Resurrection not occurring, and there is the same chance that an atheist will view the evidence as demonstrating a miracle. The historical critical method is never in reality “neutral” – even if it is in theory. Kurt Noll’s op-ed in The Chronicle Review, ‘The Ethics of Being a Theologian’ (27 July 2009) has generated a fair bit of discussion. As always, he’s controversial and stimulating. At best he makes succinct points that cut through the BS which is the unfortunate yet not always inappropriate acronym of Biblical Studies. At worst, his near positivism could do with some nuancing. There is something quite true in this contrast, in that some methodologies are inherently better than others at finding new aspects of what is true and real. Astronomy wins hands down over Astrology, for example. But when Noll talks about non-theological methodologies which are “unencumbered by overtly ideological agendas”, everything turns on Noll’s use of the word “overtly”. Theology is overtly a means to use data to defend existing presuppositions. By contrast, in biblical and religious studies, at best, our ideologies are less overt. They’re still there, of course, as “the trendy postmodern” thinkers highlighted. Yet a fundamental difference exists in that so many more of the presuppositions of religious and biblical studies are themselves open to challenge and reformulation. It’s not enough to just point the finger and say, “You’ve got presuppositions too!” Well, d’uh. Of course we do. Instead, the salient question is this: “What kind and how many presuppositions aren’t you willing to challenge?” Sure, in practice, our willingness to change our presuppositions and paradigms might be slow. But only in theology are too many such changes prevented on a priori grounds, and only in theology is this defence of so much of what is already believed held up as a virtue. The difference between serving your ideology and being open to data is always one of degree. But it is this very relative difference which makes the distinction between theology and academic studies so fundamental. So I am in this amazing study, right, and it’s just lined with books. I am running my fingers along the spines, not even looking at the titles really – it’s the overall feel of them that tells you all you need to know. And he is sitting just over there, in that leather armchair, barely visible through the smoke. I don’t mind the smoke – it’s from a pipe, or a cigar maybe, take your pick. He’s got that look in his eye, I just know it – you know the one – a smoldering sparkle just ready to burst into flame. I can tell even if I am not looking at him. I pretend to look at the books. But sooner or later we are going to have to talk and it will be me that has to say something, we both know this. Why would he say anything? He is the one all comfortable in that chair. All smug with the world revolving around his finger. The weight of the room tells me this, the feel of all those spines tells me this. Even the smoke tells me, intoxicating me with its sweet strength. I am the one who is light, who barely leaves a mark on the thick carpet as I circle the room. I am the one who might bend or break. He knows this, is sure of this, and so can just watch through the smoke as I let my hand caress those spines. My circling has taken me to the dark corner behind his chair. And although the leather back of it is high and its arms curve wide to embrace him, I reach around and take the pipe (although I think it’s a cigar) from his mouth. He likes this. He thinks it’s a game. It’s not just his eyes that are sparkling now. This is a game he likes to play, has played before, and wins every time. Why talk when you can play this game? But I don’t want to play this little game anymore. There are rules I want to bend and break.